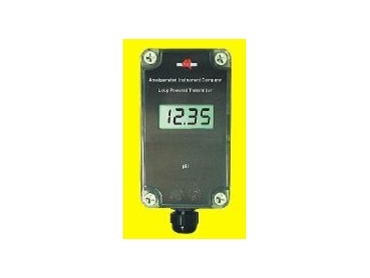 THE RT4-PH intelligent loop-powered pH display/transmitter, from Amalgamated Instrument , features a 4 digit LCD display housed in an IP65 environmentally rated field mount enclosure. The instrument is powered by a 2-wire 4-20mA loop. A pH reading from an attached electrode is shown on the unit's LCD display and retransmitted as a scaled 4-20mA analog signal. Automatic temperature compensation is included. The RT4-PH accepts Pt100 or Pt1000 RTD temperature sensors. The 4-20mA retransmitted signal can be scaled as required across any part of the pH range. This would be valuable in applications where there is not a wide variation in pH but a good changing output signal is desired. The display can be set to show pH or solution temperature when a temperature sensor is connected. It can be configured to "toggle" between pH and the solution temperature. The pH calibrations are carried out using known value calibration solutions and the pushbuttons within the RT4-PH. The instrument has a special "slope" indication to provide the user with a gauge of the electrode health. No special tools are required to setup and calibrate the unit. It is compact, clearly visible and very powerful in the features offered. It is suitable for applications where information is required in a environmentally challenging location, where power is not available and where the information is required to be retransmitted for further display or monitoring. A model for ORP measurement and retransmission is also available.